I’ve finally acquired a copy of the “confession” of H.H. Holmes as excerpted in the Phildelphia North American on April 11, 1896, which was cited by many regional papers as the source of many of the famous “Holmes” quotes, including the notable “I was born with the devil in me” passage. That portion was absent from the complete version of the “confession” that was published in The Philadelphia Inquirer on the same day . There were a couple of parts that were unintelligible in the scan, but in one major case I was able to fill in the blanks using excerpts published in regional papers. Buried in the middle of it, there’s a point where the North American says their own source is the advance proofs of the confession Holmes’ own hand (presumably the one that was published in the Inquirer, which they studiously avoid mentioning). Through most of the article, they subtly imply that the confession was written for THEM. My first inclination was to think that they got a look at the proofs and tried to reconstruct it from memory – this certainly seems to be the case in the parts about turning into the devil, which are also in the Inquirer, though in different words. However, none of Holmes’ direct quotes in the article actually appear verbatim in the full version, and a couple of sections are unlike anything that occurred in the confession at all, making me wonder if they just made it up altogether. This is all probably going to boil down to whether The North American was a respectable paper of more of a tabloid in 1896. Most of the other articles that I can see in the margins of the scan seem respectable enough, but most of this article is pretty much “pot boiler” writing, re-stating a few main themes and concepts over and over to stretch what little info they had to go on to cover their full front page. Many regional papers printed excerpts from the North American, including the portion about Holmes mutilating his son (which does not appear in the full version). Since every regional paper demurely refrained from including all of the details of that part of the story, I had thought that their source paper might have the full version, but it doesn’t appear to. Since the scan of that portion of the paper at the Free Library was unreadable, I’ve filled in the blanks using an excerpt of it published in the Sydney Morning Herald. 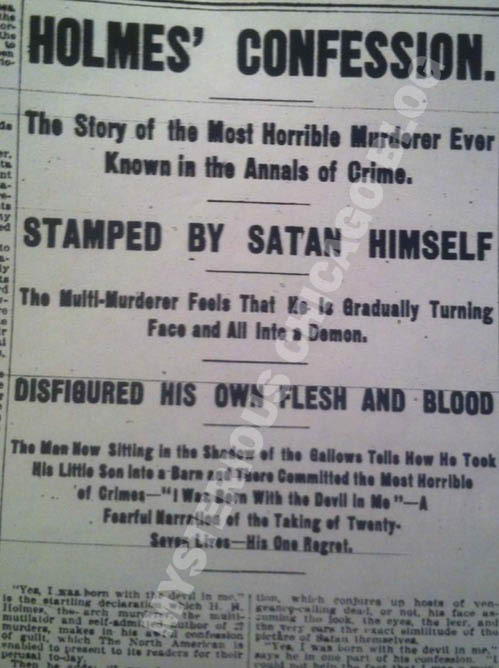 You can get a full analysis of the confession, plus the two slightly different ones published and attributed to him in the Inquirer and in the New York Journal, in our Three Confessions of HH Holmes ebook, and a ton more primary source data in our Murder Castle Ebook, much of it made available there for the first time. Also see our Master List of Known and Suspected Victims and our Top Ten Myths regarding Holmes. My full transcription of the article is below – thanks for Peter Stone Brown of Philadelphia for digging it up at the Philadelphia Free Library! Saturday, April 11, 1896. Eight Pages. One cent. “Yes I was born with the devil in me,” is the startling declaration which H.H. Holmes, the arch-murder, the multi-mutilator and self-admitted author of 27 murders makes in his awful confession of guilt, which the North American is enabled to present to its readers for their perusal to-day. This startling declaration strikes the keynote of the long and revolting story told by the arch murderer himself, and which was written word for word by the man now sitting in the shadow of the gallows and awaiting only the fatal moment when the noose will be placed about his neck and his power ruthlessly and recklessly to destroy will forever be removed. This confession, this terrible record, of slaughter made by the man himself and over which he seems to gloat as he leaps from word to word in the written recollection of his blood deeds, at last tells the true story of his murderer’s life, his motive and the dark inspiration that led him to choose a life to devoted absolutely and fervidly to the pursuit of murder. Imbued with the conviction that he was born for murder, that he was possessed of the evil one, and that he really at this moment is gradually but surely turning body and soul into an imp, a representative of the infernal regions, under whose banner he has so long served, this man, feeling not the slightest pang of remorse, and expressing no regret whatever for the twenty-seven souls he has ushered into eternity, sits to-day and, more like demon than man, tells the story of his bloodthirsty career. Beginning at the date of his birth, the impious character of which he so graphically describes in the opening sentence, he leads the reader on line by line through the chapters reeking with gore and swelling to heaven with the foulness of his deeds until he pictures himself as a fiend, a monster, changed not only in mind actually in feature, to the demon he has lived all his life long. He tells with awfully dramatic effect of his registered vow to learn the subtle qualities of fatal drugs – the agencies that kill be sleep and stealth – the employ ( UNINTELLIGIBLE one line) -cine, and made doubly dangerous, he meant to pursue. He speaks of the holy bond of matrimony into which he entered while still a youth, and his ghastly mutilation of the innocent result of that union. n and on he goes, and tells with utter abandon of the murder planned, carried out and the out beings whom he put out of the world, and whose friends never knew how they died. He designates them by name, as a tradesman would his wares, and speaks of the fine work he did here or the botch me made there. Only once does he show remorse, and that is when speaking of Minnie Williams. Throughour the long story, that reads more like a book of the wildest kind of fiction, the pen never falters, and the gloom of the cell never for a moment seems to dim the page. In conclusion he declares that an abnormal deformity is gradually taking place in his form and features, and standing as he does on the threshold of his doom, declares, multi-murderer that his is, that he is already the living personification of Satan himself. Can it be, indeed, that the evil one has actually put his mark upon his own in such a way that it cannot be mistaken, or is it the ( ) of a demon in the flesh that occupies the cell in the County Prison? Verily, the North American is led to believe that such is the case. In prefacing the confession of his many murders, which cover in full nearly three newspaper pagers, written in Holmes’ own handwriting and detailing with a minuteness that is simply at times revolting, the arch mutilator and author of twenty-seen murders, as he admits himself to be, states with something like pathos that he does so simply that he may obtain enough money to educate his boy. That “boy,” outside of one of the victims of his numerous tragedies, seems to be the only human thing that ever reached the absyssmal heart of H.H. Holmes. It was because of the love of the boy primarily that he determined when he found the shadows of the gallows closing upon him to accept the offers made in big sums of money to write a confession, and it was because the lad that the latter might be left enough money to see him safely through life, that the fantastically criminal father accepted the offer and wrote out night after night by the dim burning light in his cell the words which rise up against him and stamp him as the most terrible of human monsters that ever lived since the days of conspicuous degenerates began. It was then that Holmes made the request of Judge Arnold of “the light in his cell,” and procured copy paper and pens and began to write the memorable document, the advance proofs of which the North American has seen, and which in part this journal reproduces below. -tion, which conjures up hosts of vengeance-calling dead, or not, his face assuming the lok, the eyes, the leer, and the very ears the exact similitude of the picture of Satan themselves. “The inclination to murder came to me as naturally as the inspiration to do right comes to the majority of persons. “Where others’ hears were touched with pity, mine filled with cruelty, and where in others the feeling was to save life, I revealed in the thoughts of destroying the same. “Not only that, I was not satisfied in taking it in the ordinary way. I sought devices strange, fantastical and even grotesque. It pleased my fancy. It gave me play to work my murderous will, and I revealed in it with the enthusiasm of an alchemist who is hot on the trail of the philosopher’s stone. This inclination, according to the multi-murderer, followed him up through boyhood, confronted him as he stood on the threshold of manhood, and when he entered into the sacred state of husbandhood it even confronted him there in an eveil shape, and led him to think of murders then to be committed, to be kept in oblivion for some time to come, but finally to be divulged before HEaven and earth and rise up against him as he mounted the steps of an avenging scaffold. This feeling so grew upon the man that he lost all affinity for his brother man. He felt himself apart from the rest of the world, and endowed with a mission to destroy everyone and everything that crossed his path. So possessed had Holmes become with this belief that he grew to imagine himself a part and parcel of the Inferno, and now that he is imprisoned, and his brooding thoughts have more time to work on his disordered brain, he is fully convinced that physically as well as mentally he is slowly but surely growing to look like a devil, and that incipient malformation has already taken place. “I mean, in fact, that my features are assuming nothing more nor less than a pronounced Satanic cast; that I have become afflicted with some disease, rare but terrible, with which other physicians are acquainted, but over which they seem to have no control whatever. “That disease,” said he, “is a malformation or distortion of the osseous parts, causing deformity so marked that in many cases men are made to assume likenesses to the inferior animals. “The horror of the thing did not pall on me, for it was quite in keeping with y nature, and like a true medical student I began to study the new conditions which had arisen. Holmes’ confession from this on speaks of his early experiences of his boyhood days on the farm up in Vermont, and the life he led, until he entered college to study medicine in Mighican. It was not until after he graduated, fully equipped with the knowledge of poisons and the easiest way to sever the simple thread of life, that Holmes bgan his career as a murderer and mutilator. “And I would have committed six other murders,” he added, “had not certain occurrences intervened. Possibly one of the worst, most brutal, revolting and disgusting crimes this arch-murderer ever committed was one he speaks of in a chapter devoted to his boy, the son of his first wife, whom he married in New England while but a youth. The chapter in question tells a story that is hardly credible, coming as it does from the lips of a father, and outranks for (unintelligible) any other act he ever committed. We refrain from quoting the details)…. Josh – there are some references from the 1890s to such cylinders, and I think a few are still extant, but it's to be assumed that it was an actor's voice, not his. the wax cylinders? I have failed to find any solid proof that wax cylinders with Holmes voice even exists! I am advancing upon a previous research paper of him and am scrapping for every primary source I can get my hand on. Thanks, Nate! the scan is tough enough to read on some of the English words! I can correct one very minor typo. "Nascor (? non fit" must actually be "Nascitur non fit". That's part of a Latin saying, "Poeta nascitur non fit", which means "A poet is born, not made". Without "poeta", it just means basically what Holmes was saying, i.e., he was born the way he was.